I’m just not feeling the love. Spring brings its own special colour and creatures. I carefully aimed away from the ice, snow and slush in this photo. It turns out to be pretty easy when the birds are in the trees. All this positive self-talk about the wonders of spring is leaving me unimpressed. It’s still my least favourite season by a long shot. Every dog, and its season, has its days. I started off liking spring as a kid. It was time to splash in the puddles with my rubber boots, throw snowballs at recess time and watch renegade water run six-feet high in ditches. There seemed to be water everywhere and it was fascinating to watch it run across the road. One of my quirks is that I thoroughly enjoy water as long as I’m not wet. It took way too many years before I finally made it thru spring without misjudging the level of cold water rising toward my unprotected leg and getting a booter (filling my boot with water). When the challenge was over, maybe the novelty of the season also wore off. As a teenager, I wanted to quit school and run away every spring. Perhaps because I never did, it was a feeling that tended to return annually. This season may buoy other peoples’ spirits but it makes me restless, bored and out of sorts. I think you really have to hate winter to argue that windy, cloudy days with a high probability of mud, freezing rain and guck spattered all over your windshield are somehow an improvement. Oh sure there are the occasional wonderful spring days but they all seem like a taunting exception to the reality. Every dog, and its season, has its days. I guess the good news is we’re one step closer to fall. Maybe I need a booter to get into the spirit of spring. Spring means snowy owls leaving for cooler summer days. I wonder if I should follow them! I still remember that day I took the snowy. The sun just came out of the clouds and I was facing these dark clouds hoping to catch the snowy in flight over there. It really is about the light. Marvellous photos, and an amusing rant. Thanks for sharing, as usual, and sorry for finding joy in your misery… It’ll be over soon (the spring here in Morocco is like summer in Finland, so I don’t mind…). Glad you found some joy there – that was my goal. No need to take everyone down to my level! It would be strange to have familiar weather in different seasons like you are experiencing. Good days happen in all seasons. I’m an autumn girl (& wishing it would hurry up and arrive here in the southern hemisphere). I like the mild temperatures and the sunny, calm days; nights cool enough for sleeping, no spring hayfever, still warm enough to get onto the rivers in a canoe …………………………..
I’m happy to leave spring to you and the vast majority. I didn’t expect to change any minds but hoped that at least a few people would disagree with me so thanks for that. Each season seems to have it’s great points and the other ones. If pressed, I’d have to admit there are good days in all season (just a lot more in fall). If I ever found a place that I liked the weather all the time, I’d want to move there. Still looking. There’s three good reasons that work for me! My energy just drains when it’s hot. What a great post! Though I can relate to the boot full of water on a hike – or worse, the boot full of cold SNOW – I never heard the term ‘booter’! What I love most about the post, however, are the stunning photos of these birds, each doing his own thing. I find anything in my boot besides what’s supposed to be there a problem. Snow can be an issue and it was the last couple of months. I keep thinking, I’ll be fine, I don’t need gators and then the snow melting in my boots says otherwise. I’m happy to introduce you to a new term. Glad you liked the photos – those birds definitely do their own thing. I really like your departing snowy pic. I am with you, spring is not my favorite season. I would be happy to follow the snowy too. It would be fascinating to follow the snowy owls on their long journey. That would be quite the wildlife adventure. That’s a great tribute to the benefits of two seasons. There are many good days and activities scattered all throughout the year. It’s one reason I like that we have seasons since there would be so much that we miss without the changes. You really must do something about this (apparently) negative springtime attitude. Judging from the contents of your post, I hope you didn’t bite your tongue while it was residing mainly in your cheek as you composed it. 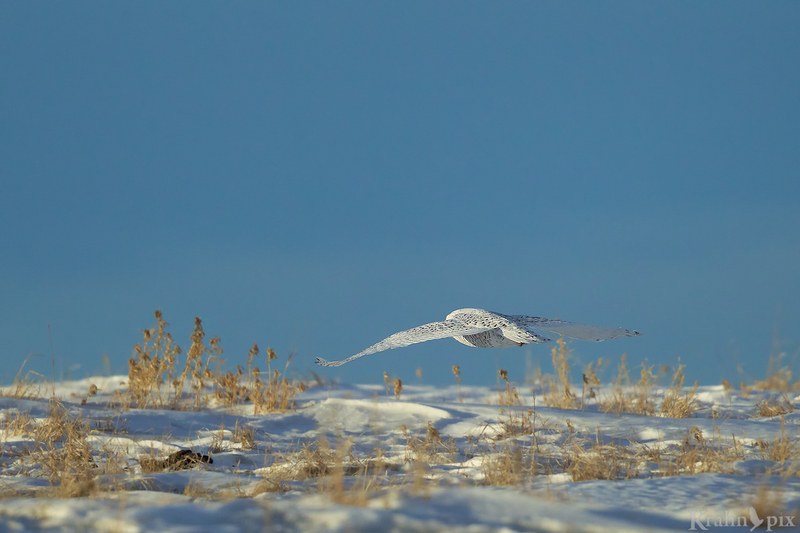 Your image of the snowy owl retreating is nothing short of spectacular. Fortune favors the Really Ready. I’m glad you liked that retreating snowy owl. It breaks some standard photography rules (like showing the eye) but sometimes the exceptions make for better photos. I have come to really it. Me tongue in cheek? Ah … yes I guess have done quite a few of those posts so I keep readers slightly confused (that’s probably not good). This time, however, I wasn’t. Spring really does affect me. Writing this post was my way of trying to do something about it and add a little humour. I guess we all have our quirks. I love spring, but I guess it is the one season full of disappointment, one day 15 degC, next day it is snowing….at least here 🙂 Very nice pictures – the flying slowly owl is beautiful! Yes that pretty much describes spring here too! You likely fall in the majority by liking spring – we all have our preferences. I’m probably fussier than most but then I console myself that I enjoy the great days more. Glad you liked one of my favourite snowy owl shots. The magical light that day really made the shot. I like very much your last photo: shades of blue, dried plants and the place of the owl. And that blue bird, I don’t know its name, looks nice, too. My head keeps telling me that the snowy owl shot isn’t good because I missed the shot I wanted and ended with a rear view. But I keep coming back to a couple of shots like this keep posting them because I really like them. I’m glad you share that perspective. I’m not an expert by any means on bird names but I think it’s a mountain blue bird. 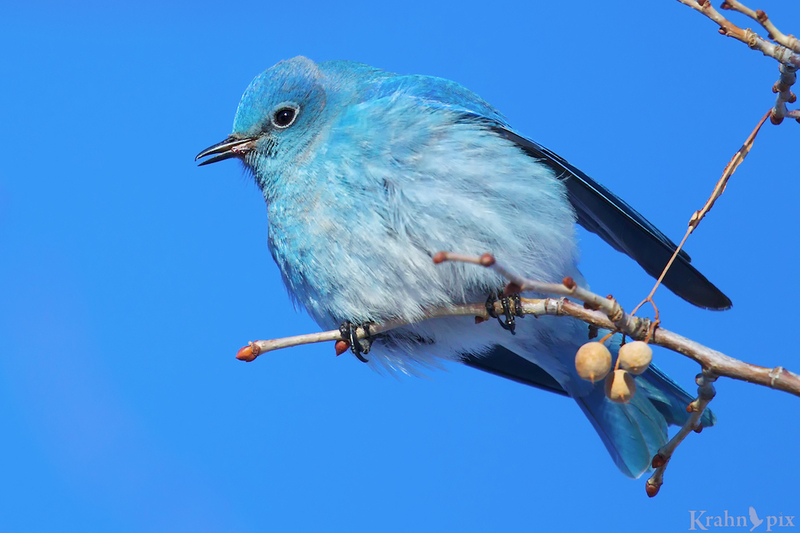 But that blue bird is soooo cute and almost seams artificially colored like the dyed Easter chicks of bygone times. I don’t often photograph small birds but the colour on this one sold me. I do remember dyed Easter eggs as a child – those had some crazy colours. Well that is a gorgeous blue bird! Goodbye Mr. Snowy Owl, see ya next year. But look on the bright side…since Spring is synonymous with new growth, maybe you should do some planting and then be all ready for flower shots in just a few short months! That would be exciting right?!? Well that’s a whole new side of you I didn’t know about. You do realize that little gators aren’t generally referred to as flowers, right? You know I’m always trying to find a new niche market right? What do you think of this idea… A whole line of alligators and penguins decorated with flowers! Gold right?! Thx. “They” are no doubt right and I keep taking baby steps to acquire patience. I just can’t ever find it in pill form which would really help! Beautiful photos, as always, Lyle. Autum was my favorite season in New Emgland. Trees turned brilliant colors, cool crisp mornings and warm afternoons. Even at dusk the forest seemed bright with the maples in full swing. In Oregon, I vote for spring. Our winters, in a “normal” year, a long, grey and wet. But as one musician friend back east wrote in her song, “Normal’s just a setting on the washing machine.”. I love the Snowy Owl, and will always think of Uncle Jim when I see one. I’ve wanted to experience New England autumn and your description makes that more enticing. You raise an interesting point about liking different seasons in different places. Having lived in the same province my whole life, I am spoiled by a lot of sunshine so a nice day for me is sunny and calm as long as it’s not too hot. It can happen in any season. I like that description of normal – it turns out to be elusive in most areas when you try to define it. My head keeps telling me that the snowy owl shot isn’t good because I missed the shot I wanted and ended with a rear view. But I keep coming back to a couple of shots like this keep posting them because I really like them. I’m glad you share that and it brings fond memories. Start some seeds. That should help. I think different things help different people. I even killed a cactus plant!